This is an extremely difficult post to write and there are massive tears streaming down my face as I type this. Here is the picture my friend Kris sent to me of Joey and is family when she delivered the finished quilt to him. This is Joey with his 100 Good Wishes album.﻿ That smile will always warm my heart. So many of you, my kind and generous quilting friends, sent fabrics and wishes when I put out the call for help to make this quilt a reality and for that I can never thank you enough. 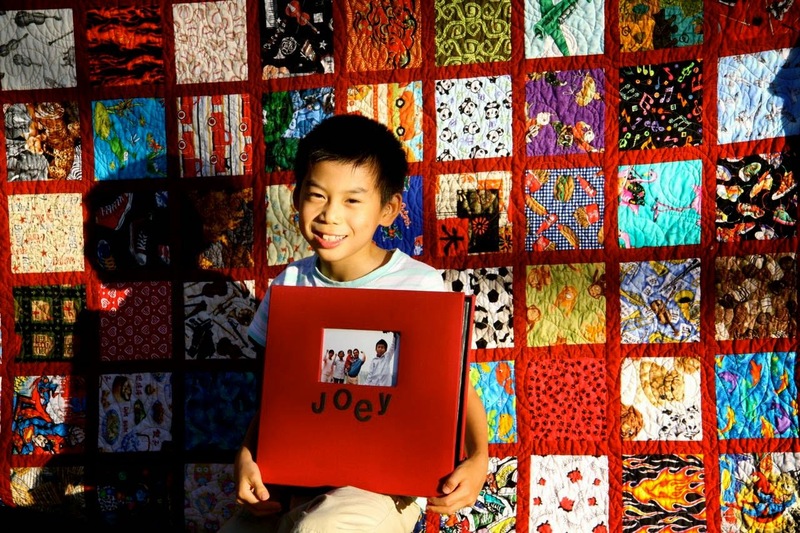 I know that the quilt and the love that it contains has helped Joey and his family through this long journey. This is a recent photo of Joey. It hurts to see just how much his poor body has endured as they continued to battle the cancer that was raging though him. Of course, you must have deduced by the title of this post that despite trying so very hard, Joey finally has lost his battle. The cancer has won. And that makes me so very angry! I knew it wasn't going to be long when I got the news Monday night that he was in a coma and they were med-flighting﻿ him from the hospital in Ohio back home to Gainesville. He left this world on Wednesday. 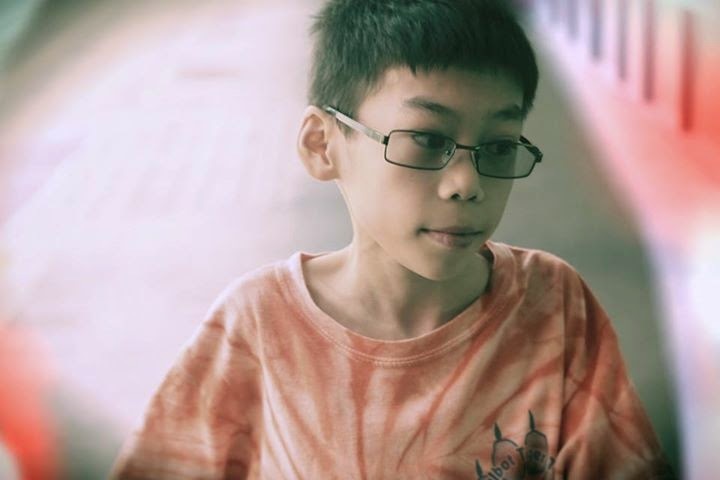 If you would like to post to his mom Kathy's Facebook page, I'm sure the family would gain strength that will help them through the coming days. No child should be diagnosed with Cancer let alone die from it. But he tried as best as anyone could and maintained a brave face through it all. Joey I know you are in Heaven gazing down on your grieving family and friends and I for one am honored that you touched my life. I'm so sorry to hear about your sweet friend. What a sweet little boy and not child deserves this! 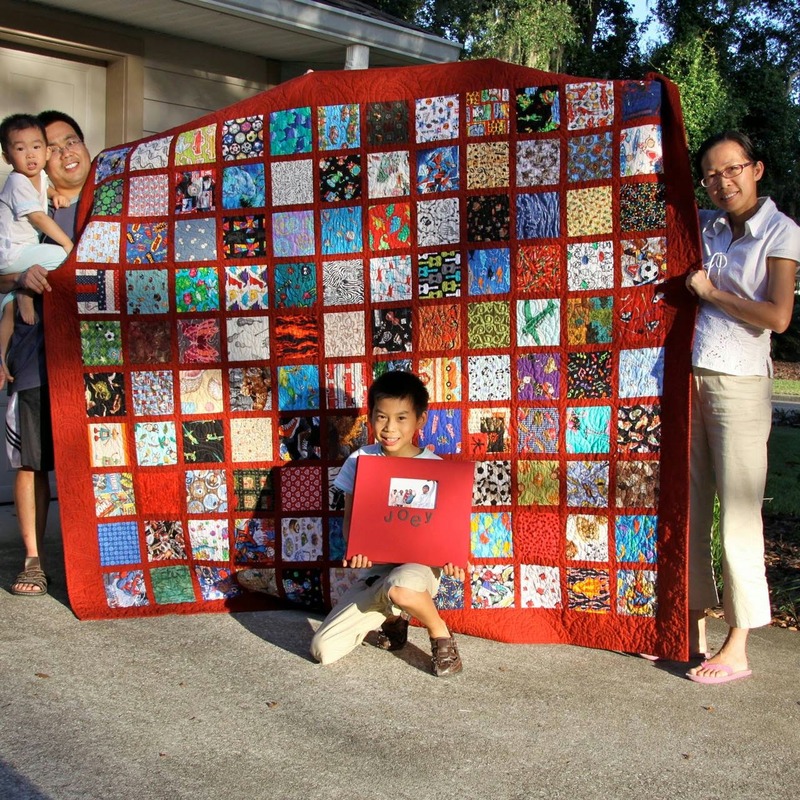 Your quilt surely brought him and his family great joy! I will keep him in my prayers. I am so sorry to hear about Joey. I remember when you put the call out for fabric and wishes for him. I was one of those who responded and know he loved the quilt. If I remember correctly he played the violin. His music has been silenced here on earth but I know he's playing in Heaven. I'm so sorry, Michele.. for you, the family, and all who journeyed with Joey. I do hope you find comfort in knowing that your quilt was a very bright spot in his life. We often wonder what we can do to help in these terrible situations.... you acted and created a quilt chocked full of love for Joey to treasure. God Bless. My heartfelt condolences to Joey's family and friends. So sorry for this loss to you and his entire family. Hugs. My thoughts and prayers go out to Joey's family during what must be a very tough time of grief and loss. May they always be comforted by your 100 wishes quilt and Joey's strength of spirit surround them and bring peace to them in what is certainly a very rough time for them. So sorry to hear of his loss. I am so very saddened to learn this, my heart goes out to Joey's family and friends. 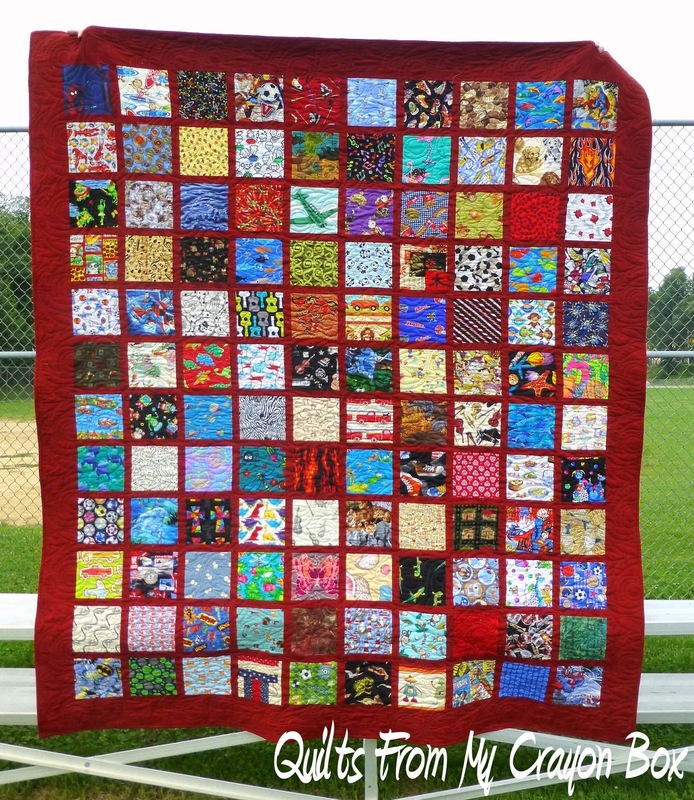 I do remember when you requested fabric for this quilt, I thought that it was such a awesome idea and I did pick a few blocks that I knew would make him smile. In my heart I believe that he is now pain free and I hope with time his family will find peace and strength to carry on without Joey. My heart is sad. Sending prayers to you and Joey's family. This is so sad. Joey was such a brave little fighter. May he rest in peace, God rest his soul. Love and condolences to his family. Praying for the family and friends of Joey. So sorry for your loss. This is really sad news. It breaks my heart to see his sweet face and know that he suffered so much. Your quilt was such a great gift to him. Condolences to the family. 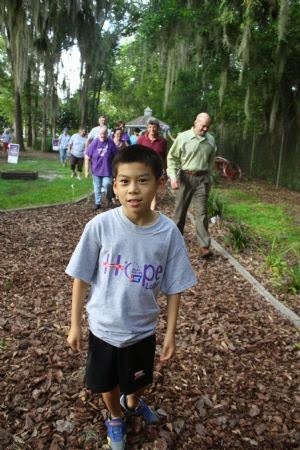 I am so sorry to hear about Joey, it is always so sad when someone loses the battle with cancer and especially a child. My heart goes out to his family and I will keep them and you in my prayers. The quilt is gorgeous. Your help was wonderful. Poor little guy...my heart breaks for the pain he was in and heartbreak for his loving family and friends. Heavenly Father just welcomed a sweet angel boy back to his presence. Hugs!